Labor standards–wages, hours, benefits and age limits–were a thin patchwork in the U.S. until the Fair Labor Standards Act (FLSA) of 1938. The Franklin Roosevelt administration considered FLSA its most significant social legislation after the Social Security Act of 1935. In its initial form, FLSA provided a 25-cent-an-hour minimum wage, a 44-hour straight-time work week, time-and-a-half pay for overtime and a minimum working age of 16. However, there were exceptions and exclusions. The Roosevelt administration was opposed by an unreconstructed Supreme Court, losing the issues in a 1935 case [Schechter Poultry] and losing in its “court packing” efforts of 1937. To resolve Constitutional issues, FLSA focused on occupations related to interstate commerce–notably manufacturing–generally omitting coverage for agriculture, construction and many services: transportation, retail trade, government, health care, education, publishing, machinery repair and domestic work. The 1938 law also excluded coverage for union shops, as endorsed by both AFL and CIO out of fears that a wage floor might presage a wage ceiling. It survived two Supreme Court challenges in 1941. [Darby and Opp Cotton] By then, former Pres. Roosevelt was serving a third term and had appointed a majority of the Court: Justices Hugo Black, Stanley Reed, Felix Frankfurter, William O. Douglas and Frank Murphy. There have been three notable eras in federal minimum wage. 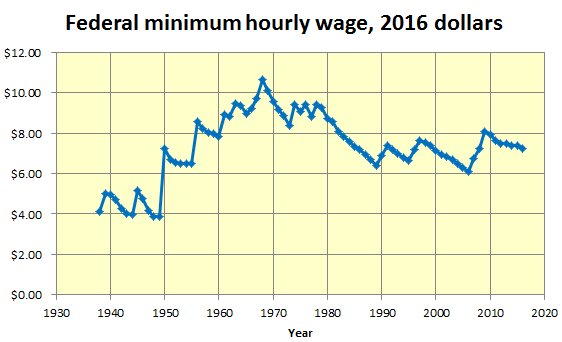 The Franklin Roosevelt through the Lyndon Johnson administrations substantially increased the wage level, starting around $4 an hour and growing to around $10 an hour–in 2016 dollars–during 1938 through 1968. The Nixon through the Reagan administrations substantially shrank the wage level, from around $10 to around $6, during 1968 through 1988. The Herbert Bush through the Obama administrations maintained a stagnant wage level between about $6 and $8, during 1988 through 2016. Labor standards in retail trade made progress through state initiatives–notably in setting minimum wages. Every state now has laws that benefit some workers outside the initial FSLA focus. Even in the “at will,” “right to work,” wage-and-hours-free state of Mississippi, employers can’t fire a worker because of jury service, if a worker provides “reasonable notice.” As of the start of 2016, more than half the states had a statewide minimum wage higher than the federal standard: 29 states plus the District of Columbia. Currently the District is highest at $11.50 an hour, while California and Massachusetts are next at $10.00–to be compared with the $7.25 federal standard since July, 2009. Alabama, Louisiana, Mississippi, South Carolina and Tennessee have no state minimum wage. Georgia and Wyoming wage levels are below the federal minimum. The Deep South was the region most hostile to FLSA in the 1930s and remains the region most hostile to labor today. FLSA allows states and cities to enact stronger requirements. During the Truman and Eisenhower administrations, some states and cities began to close gaps in wage and hour coverage left in 1938. So far, no labor scholar has published an inventory of those initiatives, but sectors often involved appear to be retail trade, construction and transportation. At the same time, business interests began to promote anti-union, “right to work” laws, authorized under the 1947 federal Taft-Hartley Act. The earliest of them, predating the act, was an amendment to the Arkansas constitution. Statewide laws are currently found in 25 states that are generally hostile to labor. The Kennedy and Lyndon Johnson administrations began to expand FLSA coverage beyond narrow views of interstate commerce dating from the Great Depression and earlier. FLSA amendments enacted in 1961 included employees of retail trade firms with at least $1 million in annual revenue. Amendments enacted in 1966 included employees of schools, nursing homes, construction firms, commercial laundries and large farms. Domestic workers: Sustaining work performed inside and near homes–care for children, the elderly, sick and disabled, cleaning, cooking, pet and plant care, laundry and other household services–had not been a focus of federal and state standards, in contrast with work performed away from homes. Domestic work currently remains at the far reaches of labor standards in most states. A pioneering effort in Massachusetts–coordinated by Melnea Cass, the legendary Boston activist for civil rights and housing–resulted in the first state labor standards law covering most domestic workers. Chapter 760 of the Acts of 1970 provided coverage under the state’s wage and hours law: minimum wage, maximum weekly straight-time hours, overtime pay and contributions to Social Security and Medicare. For workers employed more than 16 hours per week, the 1970 law required workers compensation and unemployment insurance. These were all standards that had applied to most other jobs in Massachusetts. FLSA amendments enacted in 1974 set federal standards for some domestic workers but specifically excluded workers providing “companionship services for individuals who…are unable to care for themselves.” It also excluded all live-in workers from overtime pay benefits. [29 USC 213] Intermittent and varying work hours and direct employment by householders have proven to be areas of difficulty. Some observers estimate that two-thirds or more of U.S. employers subject to FLSA fail to comply fully with the law. In 2013, the Obama administration revised regulations to extend FLSA coverage to all domestic workers employed by agencies, regardless of duties, effective at the start of 2015. However, some workers without specialized training may not be eligible for overtime pay, and workers directly employed by householders remained excluded from coverage. These and other gaps are slowly being addressed by state laws specific to domestic workers. As of August, 2016, seven states had enacted some form of enhanced labor standards for domestic workers, and in six states those had come into effect. The first new law was in New York, enacted in 2010, followed by Hawaii and California in 2013, Massachusetts in 2014, Oregon and Connecticut in 2015 and Illinois in 2016. 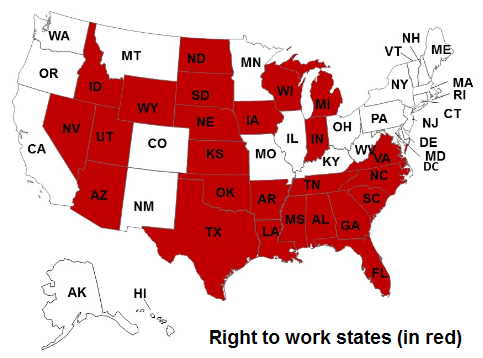 None of these states have enacted anti-union, right to work laws. While provisions of the recent laws about domestic workers vary greatly, most take into account special situations of live-in workers. Connecticut has the weakest of the new laws, providing only a guard against harassment. Massachusetts and Hawaii probably have the strongest. Only Massachusetts requires sick leave and parenting leave. Only Hawaii requires disability and health care insurance. Most states require time-and-a-half overtime pay, workers compensation insurance and unemployment insurance. Massachusetts had already required those benefits, since 1970. Most new laws require at least a day per week off-duty and some amount of paid personal leave. Some of the new requirements are stronger than those of federal labor laws and regulations. Information and compliance: Elusive elements affecting standards for domestic work remain information and compliance. That generally takes organization. NAACP chapters were involved during pioneering efforts in Massachusetts, in the 1970s. More recently, National Domestic Workers Alliance, first located in New York City but now in Chicago, was organized in 2007 from experience with Domestic Workers United, founded in 2000 in New York City. Massachusetts Coalition for Domestic Workers was founded in 2010 and is located in Boston. As anyone who has run an above-ground small business knows, complying accurately with labor law is complex. So far, no state has set up a clearing house to provide simple and centralized access to required record-keeping, reporting and payments. Large payroll services–PayChex and ADP–do not provide all the services needed to comply with state laws and are tedious to use. Concierge services, mostly available from accounting firms, can be very costly. The domestic worker organizations have not seen these issues as parts of their missions. A barrier their reports rarely acknowledge is that there is no method to report wages or to pay Social Security and Medicare contributions for undocumented workers. This entry was posted in Business, History, Regulations, Services, Taxes on August 25, 2016 by Craig Bolon. If operators of interstate natural gas pipelines succeed in getting permits for expansions in Massachusetts, they will have to raise their own funds to install new lines. On Wednesday, August 17, the Supreme Judicial Court ruled out schemes that would have subsidized new gas pipelines from Massachusetts electricity bills. Utility companies Eversource and National Grid had proposed to acquire interests in new gas pipelines and load costs upfront onto electricity rates. The Baker administration and its Energy secretary, Matthew Beaton, had supported the schemes–similar in effect to construction-work-in-progress tariffs used to force electricity customers in Georgia and South Carolina to pay for new nuclear power-plants while they are being built. Corrupt schemes: Attorney General Maura Healey and state Sen. Stanley Rosenberg (D, Amherst), the senate president, opposed the corrupt schemes. They were joined by the Conservation Law Foundation in responding to a lawsuit filed by interests in natural gas import terminals. Imports of liquefied natural gas, while more expensive than domestic pipeline gas, have helped to reduce and prevent wintertime price spikes. As documented in 2015 by Analysis Group of Boston, that approach costs less overall than installing new interstate gas pipelines. It was a conclusive decision, putting paid to the corrupt schemes engineered by the pipeline companies and to the corrupt regulations adopted by their Republican sweethearts in state government. This entry was posted in Business, History, Regulations, Services on August 17, 2016 by Craig Bolon. Will New England revive nuclear power? Many New England people became enthusiasts for nuclear power after World War II. Nuclear research reactors, nuclear equipment and service firms and one small nuclear power-plant emerged. Yankee Rowe, located in the Berkshire foothills of Massachusetts–the second commercial plant in the U.S.–closed in 1992. As of 2007 it had been disassembled and taken away, its buildings had been razed and the grounds had been cleared. All that is left now at the former Yankee Rowe site are 16 steel and concrete casks, weighing more than 100 tons each and guarded at all times, holding spent but highly radioactive nuclear fuel. One small research reactor remains–at M.I.T. in Cambridge, just southwest of Massachusetts Ave. between Vassar and Albany Sts. beside historic tracks of the former Grand Junction Railroad, now operated by the MBTA. Little known to the public, the M.I.T. reactor long ran on weapons-grade enriched uranium. Students and staff called the former Warner Calvary’s, next to the service entrance, the “nuclear diner”–zapped while you ate, no extra charge. Nuclear eclipse: With closure of Vermont Yankee in Vernon, at the end of 2014, New England was left with four operating nuclear-power units. One of those four, the unit at the Pilgrim plant in Plymouth, MA, is now scheduled to close on May 31, 2019. From peak nuclear generating capacity of 5.6 GW in mid-1991, New England will be left with 3.2 GW in mid-2019, a decrease of 42 percent over 28 years–with six of nine commercial nuclear-power units out-of-service. (Unit 2 at Seabrook was abandoned during construction and never operated.) Little of those losses can be made up from wind or solar sources, since they will stop when the wind stops blowing or the sun stops shining. Instead, the deficits are mostly being filled from newer combined-cycle power-plants fired by natural gas. The latest one, being built by Footprint Power at the site of the former coal-fired Salem Station, has about the capacity of the Pilgrim nuclear plant, soon to close. Survivors: Although not well known to most of the public, after mid-2019 New England will no longer have any operating nuclear units with relatively hazardous Mark 1 “boiling water” containment designs–like those that exploded in March, 2011, at the Fukushima Dai-ichi plant in Japan. Vermont Yankee and Pilgrim plants used those designs. The three nuclear units to remain in New England used “pressurized water” designs, with more stable characteristics. Unit 2 at Millstone, with two secondary loops, will then become the region’s least stable. It was developed by Combustion Engineering–a high flyer of the 1960s that built 15 of the 119 completed U.S. utility-scale nuclear-power units, wound down operations during the 1980s and was sold in 1990. 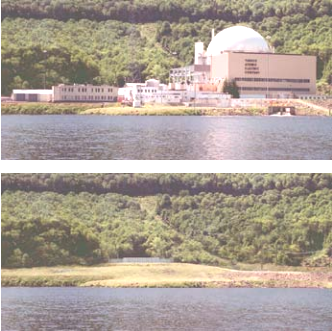 Millstone Unit 3 and Seabrook Unit 1 both use Westinghouse 4-loop “pressurized water” designs. They were both completed after the major upgrades to safety requirements that followed the Three Mile island nuclear meltdown in 1979, under supervision of the Nuclear Regulatory Commission. Three Mile island has “pressurized water” units designed by Babcock & Wilcox, with only two secondary loops. Nevertheless, margins of stability were enough that the meltdown of Unit 2 was almost entirely contained. 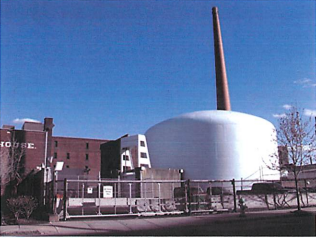 In contrast, Mark 1 “boiling water” containment designs had been strongly criticized during the 1960s for inadequate margins, but an industry-dominated Atomic Energy Commission, which was disbanded in 1975, had failed to intervene. Survival of current nuclear power-plants is hardly guaranteed. Heat exchangers, which industry calls “steam generator loops,” are major sources of added stability for “pressurized water” designs. They are also among the worst sources of failures. The reason that Maine Yankee was shut down after only 24 years service was impending failures of those devices. More recently, operators of the San Onofre plant in California squandered nearly a billion dollars on steam-generator replacements–botching the jobs, getting only about another year of service and starting disputes and chicanery after the San Onofre shutdown that could take a decade to resolve. New thinking: In the late 1990s, manufacturers of nuclear-power equipment, encouraged by academics at M.I.T. and other schools of engineering, began to work up plans for a so-called “third generation” of nuclear power-plants. It was, perhaps timely, an era of “millennial thinking.” The initial goals, in the aftermath of the Three Mile Island meltdown and the Chernobyl disaster, were to make nuclear power far safer. Rather soon, however, came notions that nuclear power-plants might also be much cheaper than they had been for some 20 years. The two concerns reflected widely perceived problems of the industry. In 1954, Lewis Strauss, then chairman of the Atomic Energy Commission, spoke at the National Association of Science Writers annual meeting, saying nuclear power would become “too cheap to meter.” He was soon countered by industry spokespersons, but the phrase stuck in memory, and notions that nuclear power should be low in cost became widespread expectations. If such notions ever had merit, they were demolished by long delays and steep cost increases to meet U.S. safety requirements added after the Three Mile Island meltdown. During the 1980s, the Vogtle plant in Georgia became a poster child for schedule and budget overruns. Its two units came on line in 1987 and 1989, more than 10 years late and at over 25 times the cost budgeted in 1971. Alvin Weinberg, a former director of Oak Ridge National Laboratory–who had enthusiastically endorsed the “too cheap to meter” claim of the 1950s–re-emerged years later to make a claim for everlasting equipment. “If nuclear reactors receive normal maintenance,” he wrote, “they will never wear out, and this will profoundly affect the economic performance of the reactors.” Dr. Weinberg was not an engineer; he had never worked in industry. Still, trained as a physicist, he should have known better. He dismissed out-of-hand embrittlement and build-up of radioactivity, and he likely did not even think about structures and control systems. Such a cavalier approach reflected “millennial thinking” that remained common in public views for about a decade. Rubber meets road, gives way: The U.S. economic recovery from 2002 through 2007 began to stimulate utility interest. During the Walker Bush administration, the Nuclear Regulatory Commission proposed a one-step process for utilities, to expedite approval of nuclear plants using standard designs. Four contenders vied for design approval: Westinghouse Nuclear, by then a division of Toshiba in Japan, General Electric Nuclear, by then a division of Hitachi in Japan, Mitsubishi Heavy Industries of Japan and Areva, the French nuclear conglomerate. No application came from Rosatom in Russia or Kepco in Korea, despite both announcing plans. Toward the end of 2007, Nuclear Street, a trade publication, reported 34 letters of intent to build new U.S. nuclear-power units. Of the 28 naming a design, 14 proposed to use the AP-1000 from Westinghouse. By the late 1990s, academics and consultants were enjoying great sport as market speculators, projecting ever lower costs based on supposed economies of scale. In order to exhibit the lowest possible amounts, they touted so-called “overnight” costs–omitting interest, infrastructure, land and site preparation. “Overnight” estimates ranged as low as about $1 a watt, although some plants from the 1980s had cost around $4 a watt, before factoring inflation. After glory days of a so-called “nuclear renaissance”–around 1997 through 2007–both everyday and episodic factors intervened. The rubber was to meet the road when the equipment builders proposed prices and their potential utility customers had to figure out whether they could afford the tabs. Starting in 2008, along with a sharp recession, the tabs came in high: at least $4 a watt, maybe more. The outgoing Walker Bush administration assembled $18.5 billion in a loan-guarantee program, likely supporting less than 5 GW of capacity and perhaps four nuclear-power units. Soon the incoming Obama administration faced huge economic stress to reverse the Walker Bush recession, the worst downturn since the Great Depression of the 1930s. It was eager to identify fast-growth opportunities, and it offered nothing more toward slow-growth nuclear power. Then came the Fukushima nuclear catastrophe in March, 2011, and financial losses threatened by the January, 2012, shutdowns of both San Onofre units near San Diego. Those episodes capped off a would-be “nuclear renaissance.” U.S. support for investments in nuclear power collapsed. Active applications to build third-generation nuclear-power units in the U.S. dropped rapidly. In states with deregulated electricity markets, none survive. Utilities operating as unregulated merchant power generators proved unwilling to accept financial risks at prices being proposed–with or without loan guarantees. Only utilities continuing to function as government-backed monopolies maintained interest. Of 34 proposed new nuclear-power units, as named in 2007, only four units are now active–all using the Westinghouse AP-1000 design. Two are under construction at the Summer plant in South Carolina, and two are at the Vogtle plant in Georgia–the 1980s poster child for cost overruns. These projects took the federal loan guarantees, emptying the pot. Propping up survivors: Odd as it might sound, Andrew Cuomo (D, New Castle), the New York governor opposed to the Indian Point nuclear power-plant in Buchanan, NY, has arranged subsidies funded by electricity customers to prop up four other nuclear-power units in the state. Estimated only a few months ago at perhaps $200 million over about ten years, the subsidies are now widely reported as likely to cost $8 billion or more. Within days Exelon, which already owned three of the units, announced a plan to buy the fourth from Entergy. Exelon is able to economize by sharing personnel, now the main expense of running nuclear plants fully depreciated years ago. FitzPatrick and 9-Mile Point 1 used the Mark 1 “boiling water” containment design, the same as Vermont Yankee, Pilgrim and the wrecked Fukushima Dai-ichi units in Japan. If the two plants in New England deserved to be shuttered, then so do FitzPatrick and 9-Mile Point 1. However, unlike the many, longstanding critics of nuclear power in southern Vermont and eastern Massachusetts, in upstate New York very few people are demanding action on hazards their region faces. There are no signs that the Cuomo administration has genuine concerns about such hazards either, aside from personally and politically motivated attention to the Indian Point plant, located less than 15 miles from the governor’s home. Others disagreed. As the late Michael Mariotte of Nuclear Information and Research Service wrote, “No environmental organization took the bait. Instead, NRDC, Greenpeace, Friends of the Earth and Sierra Club decry nuclear power….” According to Morningstar, in an investment newsletter issued a week after the Hansen prayer, “Enormous costs, political and popular opposition, and regulatory uncertainty” render new reactors infeasible [as recounted in Forbes]. Low costs for nuclear power occurred only before nuclear disasters of the 1970s and 1980s, leading to stringent and costly safety regulations, and under repressive oligarchies, ignoring lessons from the disasters. Outside command economies of Russia, China and South Korea, only two of several “third generation” nuclear designs are being implemented: the AP-1000 in the U.S. and the EPR in Europe. Practical developments: The European [or "evolutionary"] pressurized reactor (EPR), designed by Areva in France, took a partly conventional approach to reliability: increasing steam generator “loops” for a “pressurized water” reactor to four instead of two or three. That was adapted from a proven design: the Westinghouse 4-loop “pressurized water” units built in the U.S. during the 1980s. The EPR specifications have been disrupted by several surges of changes, leaving the first unit in Olkiluoto, Finland, more than ten years late, with at least a factor of three in cost overrun. Last year, the government of Finland cancelled another EPR unit, but the former Cameron and Osborne regime in Britain signed up for two EPR units at Hinkley Point in Somerset, on the Bristol Channel. Recently the successor British regime, headed by Theresa May, put those plans on hold, questioning Chinese involvement in the project. The AP-1000, designed by Westinghouse in the U.S. and by Toshiba in Japan, mainly took a structural approach to reliability: providing a very large volume of passive cooling to manage a thermal spike. While the EPR design tends to increase complexity, working against reliability, the AP-1000 design tends to reduce complexity, at least in some respects. Four units are under construction in the U.S. as noted before, and four are being built in China at Sanmen and Haiyang. China has also licensed the technology, and it has developed a much-cheapened system, the CPR-1000, omitting most of the major improvements in safety and reliability. AP-1000 units in China use a cheapened design of that type, omitting protection against aircraft impacts required in the U.S.
All AP-1000 projects are running years behind schedules. Those in the U.S. suffer from major cost overruns, but there is no reliable information from China, since anyone providing it would probably be jailed or killed. Last year Chicago Bridge & Iron, one major contractor for the U.S. projects, sold out to Westinghouse, the other major contractor, creating an effective U.S. monopoly in nuclear power-plant construction. U.S. utility sponsors are protected by CWIP regulations–construction work in progress–enacted by politically captive state governments in Georgia and South Carolina and allowing the utilities to charge customers increased rates before the plants are operating. New England opportunities: So far, there are few signs that New England will respond to what parts of the nuclear-power industry might cast as opportunities. New England nuclear generation capacity has been falling for about a quarter century. Once Pilgrim in Plymouth, MA, closes in 2019, only New Hampshire and Connecticut will have nuclear power-plants operating. No utility is likely to propose any new nuclear facility for the region until the “third generation” units under construction in Georgia and South Carolina have been operating for quite a few years and unless their safety and economic performance has lived up to claims. Dominion Power, the operator of Millstone in Waterford, CT, since 2000, tried to put a squeeze on Connecticut government, similar to what Exelon has pulled off in New York. They frightened the state senate into passing a subsidy bill in April, 2016, but after that their momentum stalled. Dannel Malloy (D, Stamford), the state’s governor, could prove as susceptible as Andrew Cuomo became in New York. Last March, Malloy reportedly met privately with Dominion lobbyists and executives. Typical shell-game tactics are showing up. One news report quotes a state senator, Paul Doyle (D, Wethersfield), saying, “It’s not a subsidy.” Maybe, but it looks like a duck, quacks like a duck…. This entry was posted in Business, Environment, History, Information, Services on August 10, 2016 by Craig Bolon.